Bath tub toys have never made this type of splash. This adorable baby bath toy makes tub time into game time. Kids can shoot, squirt and score. The suction cups allow you to stick the toy to the wall or tub side in seconds. 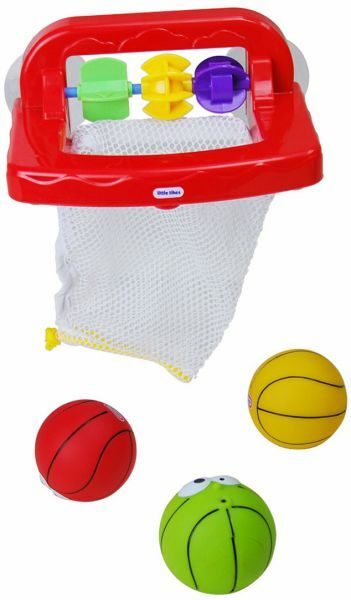 Kids have fun and the basketball format builds healthy bath time routines. Bath tub toys have never made this type of splash. This adorable baby bath toy makes tub time into game time. Kids can shoot, squirt and score. The suction cups allow you to stick the toy to the wall or tub side in seconds. Kids have fun and the basketball format builds healthy bath time routines. Suction cups hold the rim securely to the wall or side of the tub. Kids can take their shots with one of 3 colored squirting balls, each with a different fun face. When they make a bathket colorful spinners twirl. Cinch the net closed for put-and-take play and handy storage.